JH-RWL6V (Multi-Energy Monitor) collectively operates a solar power generation system, a storage battery system and a “Eco-cute” (heat pump-heating system)‎. 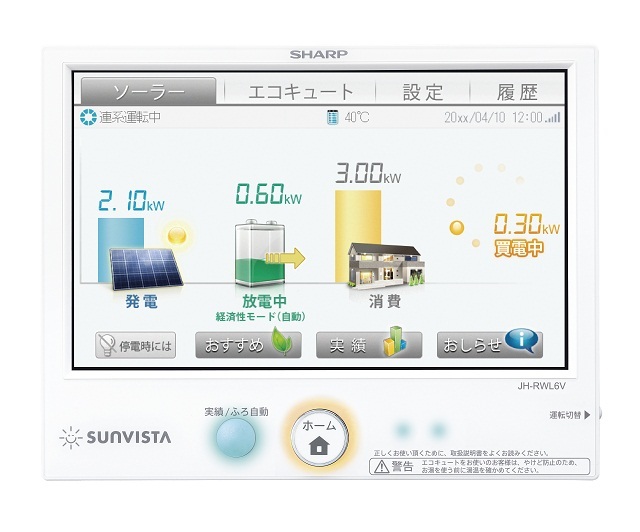 JH-RWL6V equips user-friendly large 7-inch touch screen, and supports the 4.8kWh model of our storage battery system. If you place JH-RWL6V at the time of the installation of a solar power generation system, you can also connect an additional “Eco-Cute*” or/and a storage battery system* to the JH-RWL6V in future. You can check and control the solar power generation system, the storage battery system and the “Eco-Cute” system on the single monitor of the JH-RWL6V. In addition, the JH-RWL6V can control our power conditioners up to three. The large LCD (liquid crystal display) screen shows the power generation status in figures and graphic form. With simple touch operation, you can check various information, such as the amount of usage power, the amount of solar power generation and the remaining of storage battery. You can connect the network in a wireless LAN, AOSS ™, WPS (Wi-Fi Protected Setup ™) support, to connect the Sharp solar monitoring center with easy set-up.